For over 20 years Zapata has built a body of work, which varies significantly in motif, though consistently explores themes of sexuality, opulence, and vitality in his signature style. In this distinctive hand, Zapata layers fantasy and reality, luring the viewer into his potent, cosmically beautiful world. Known for his signature "Polo" series, which first gained him critical acclaim, more recent work focuses on themes including his native Spanish culture, American Pop icons, and the state of the contemporary practice. He often draws on his experiences as a songwriter (Zapata co-wrote lyrics for Michael Jackson and Jon Secada), and exposes his deeply poetic imagination by incorporating text and visual cues into many of his works. In this way, his images coax the viewer into his realm where fact and fiction persist simultaneously, fortifying each other’s beauty, depth, and meaning. 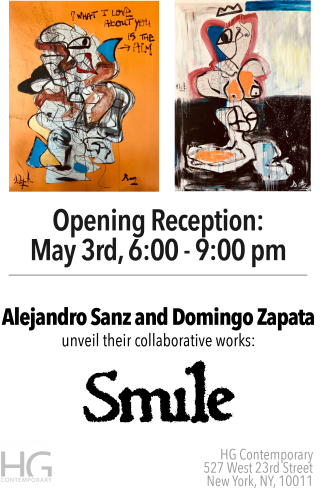 Named an "artist to watch," in 2011 by the prestigious Whitewall Magazine, Zapata has quickly fulfilled this prophesy. Since, his work has lauded praise from international press such as The New York Times (cover story, Thursday Styles April 25, 2013), Esquire Spain, Vanity Fair Italia, and The New York Observer. Recently, The New York Magazine deemed him, "in a league of his own," while the New York Post proclaimed Zapata to be the "new Andy Warhol, with starlets begging for a sitting." The future continues to promise illustrious milestones for Zapata. This year the artist is preparing a poignant, commemorative mural for the lobby of Freedom Tower in Manhattan. The piece will be unveiled as part of the building's opening ceremony and remain on permanent display. Additional commissions include a panel for the newly restored Colosseum in Rome as well as the lobby of the landmark Plaza Hotel in New York.